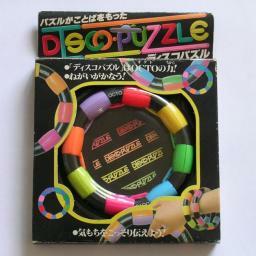 The Octo puzzle, also known as the Disco Puzzle or Meeting Colors, consists of a ring about the size of an armband, with 8 differently coloured cylindrical sections. Each section has 4 identical pieces, and can rotate. The ring itself is sliced in half like a bagel into two layers, and these can rotate too, thus mixing together the sections. This puzzle is closely related to the Combo Puzzle, though that puzzle has 6 sections of 6 distinct pieces instead of 8 sections of 4 identical ones. Octo was released in the UK in a packaging showing the magician Paul Daniels. This last factor comes about because it does not matter which colour goes in which section. This leaves 32!/4!8 /8! = 59,287,247,761,257,140,625 or 5.9·1019 positions. There are 16 orientations of the puzzle as a whole, so this number should be divided by 16 to get the approximate number of really distinct positions, namely 3.7·1018. For the exact number, you need to apply Burnside's Lemma, but that is rather complicated in this case. Choose one unsolved section, and decide which colour it is supposed to be. Rotate that section until one of its incorrect pieces lies at the inside bottom position. Find a piece that belongs in this section but lies elsewhere on the puzzle. Rotate that piece so that it lies in the outside top position. 1. Turn the top layer to bring the piece to the correct section. 2. Rotate that section, bringing the piece into the bottom half (and the incorrect piece into the top half). 3. Turn the top layer back to its original position. Repeat steps b-e until your chosen section is completely solved. Apply steps a-f to each section in turn until all are solved.